Sophie Kinsella once again get me! This book is so funny, memorable, and very fun to read! It took me 2 hours - more or less - to finally come to the last page. I want to know how the ending is but at the same time, I don't want this book ended! This is so funny, I laugh out loud through most of this book! 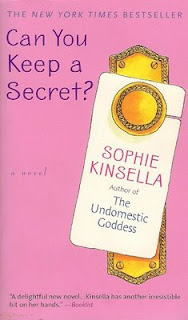 Another Sophie's best books for me! The characters are very likeable or not likeable. Each of them, we get to know them so well from others character's thoughts or even from their own dialogues. Sophie always know how to make such a lovely main characters with weird life. She builds the character really well and it gets us easily! Emma Corrigan is such a typical street girl. For some reasons, she's so related to most of us. The butterflies when it comes to our weight and Connor's opinion - her perfect boyfriend. The cousin's issue, parents' issue, most of her problems actually very down to earth. I mean, those are nothing like world first problem, it's problem that we face almost in everyday of our life. All of her secrets are surprisingly 'so us', some of them are 'so related'. Very easy to understand, very light to read. In the other hand, our prince charming in this book, Jack Harper, is once again, perfect guy. He's handsome, tall, rich, and has great personality and of course, secrets that are really mysterious and probably dangerous? Jack is by far my favourite character from Sophie's books. He reminds me of Christian Grey in some ways with his control freak - well, Jack is not really control freak, but he has control and knows how to use it, and of course, his charms among other people, his CEO - founder personality. For me, Jack Harper is better rich guy than Christian Grey. Although, I have to admit, they almost the same. The story itself is very light and easy to understand. Even though it contains some mysteries but still, you keep going on and on to find out what happens next without thinking too hard. Kinda predictable but still fun to read. I love how British-American words are used in this book, with of course, some of the habits too. The comedy is seriously hilarious! I can't stop laughing!